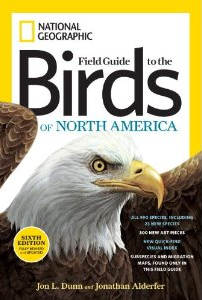 Fellow birders, I propose we refer to this guide as "NatGeo6" as an easy way to communicate the long title of "National Geographic Field Guide to the Birds of North America - 6th edition". A few years ago I picked up a copy of the NatGeo4 to have as second guide to my Western Sibley, and as my one guide that covered all of North America. I didn't use it all that much and was surprised when some of my birder heroes mentioned that it was their preferred guide. With much more field guide experience under my belt, I've come to appreciate what a quality field guide this is. Now with all the really nice updates and enhancements in NatGeo6, this will be one of the most popular field guides in the hands of North American birders. This edition sports a "Quick Find Index" on the front cover fold out - my favorite and most frequently used look-up tool. The inside of the front and back covers have a "Visual Index to Bird Families". Most visually appealing to my field guide sensibilities are the less crowded illustration plates, including improved and additional illustrations. You can still kinda tell which illustrations are the old ones, but they work. I often judge a field guide by its range maps. NatGeo6 now includes migration ranges on their maps. Good for NatGeo! Some species maps even display the different Spring and Fall migration patterns. A whole section of subspecies maps is very cool, especially as my birding interests have been increasing in that direction. With the increased space on the illustration plates, there is also more room for descriptive text and information which is excellently written. NatGeo's features are now better than ever and is the most up-to-date field guide on the market. NatGeo6 has gained a firm place among the best field guides in North America. Kudos to Jon Dunn, Jonathan Alderfer and their staff. Well done! Those changes to the maps sound especially good!